I LOVE campaign monitor! It’s by far the cheapest, best and more features available. Hard question to answer—Sorry, I have to say “EVERYTHING”! Worked well, priced me in cheaper local currency, fast sendout, very helpful tips on mis-formatted emails, phenomenal customer support, no login or password struggles…the list goes on (a double-entendre). Unsubscribe “Tag” added at the bottom of our emails was in a different font from the bottom portion of our emailout/newsletter—a minor point. We had used their service twice in the past year—with admittedly a few “hiccups”, but we had got those emails out. Their service refused to let us log in, or pay for, or reactivate our old account, so we had to create a new one—and that’s likely one factor that led to the total failure of their organization to provide the slightest bit of genuine service to us yesterday. Shortly before midnight, I tried competitor “RedCappi”, but after I edited an outgoing email address, it looked as if they might delay sending the test emails, so while waiting to see how long that delay might be, I set up a “Campaign Monitor” account, and proceeded with the same process (our newsletter html was “ready to go”—having been produced by the IT guru at our factory overseas). Despite a good half-hour lead, the RedCappi test emailouts took over an hour and a half to arrive, versus maybe less than a minute with Campaign Monitor. I was sold—uploaded all 4800 or so email addresses to Campaign Monitor without a hitch, and Campaign Monitor clearly pointed out a few dozen “oops” emails I had mis-formatted, and I was able to fix all and add them back into the emailout effortlessly. When I wanted to send to the total list, instead of to four test email addresses, I found a helpful FAQ on the Campaign Monitor site which clearly walked me through how to resend to new subscribers—a vast difference from having to “Chat” on three separate occasions with the GetResponse team to help me with their less-user-friendly system (EVEN THOUGH I HAD USED GetResponse TWICE PREVIOUSLY)! Simple to use templates for any kind of email campaign make starting a business so much easier. I spent tons of time trying to create my own from ‘free’ templates but once I started messing around with apps with which I wasn’t familiar it took time I didn’t have. At this point in time all I want is a generic template later on I may customize. On the template it wasn’t exactly clear how to insert a logo that included a picture with text if the logo wasn’t print ready. As a new customer, who is also in the process of starting a new business, I ran into a bit of a process issue because I hadn’t been able to complete setting up my website. I contacted Campaign Monitor about the issue and received a quick, thorough response on a Sunday evening that addressed my issue and also gave me a list of how to do things. I was very pleased and it made starting Monday morning without worrying about resolution so much easier. Improve the on boarding process (they are already doing this) so that issues such as mine don’t occur but I have every confidence it will be resolved. Simple to use templates for any kind of email campaign make starting a business so much easier. I spent tons of time trying to create my own from ‘free’ templates but once I started messing around with apps with which I wasn’t familiar it took time I didn’t have. At this point in time all I want is a generic template later on I may customize. On the template it wasn’t exactly clear how to insert a logo that included a picture with text if the logo wasn’t print ready. As a new customer, who is also in the process of starting a new business, I ran into a bit of a process issue because I hadn’t been able to complete setting up my website. I contacted Campaign Monitor about the issue and received a quick, thorough response on a Sunday evening that addressed my issue and also gave me a list of how to do things. I was very pleased and it made starting Monday morning without worrying about resolution so much easier. Improve the on boarding process (they are already doing this) so that issues such as mine don’t occur but I have every confidence it will be resolved. The cost-effectiveness combined with the wealth of tools for tracking and implementing newsletters For a new user it can be a bit over whelming where to start. I have been a long time user, but never a power-user. So for someone on a budget, the wealth of tools is fantastic and due my great experiences, I have now ensured other businesses use this software too. For a new user it can be a bit over whelming where to start. I have been a long time user, but never a power-user. So for someone on a budget, the wealth of tools is fantastic and due my great experiences, I have now ensured other businesses use this software too. Responsive design; clean, contemporary, flexible templates; handles images well; great reporting; prompt, helpful, friendly customer service; competitive pricing; agency discount Honestly can’t think of any at the moment. I’ve been using Campaign Monitor for several years to send email campaigns for my clients, mostly small to medium-sized nonprofits and civic organizations. I love that it’s designer-oriented – you can create your own custom templates or use theirs. They’ve introduced (and then significantly improved) flexible templates that perform very well responsively. They also take their sender reputation very seriously; when one of my clients inadvertently sent an email to an old list and ended up with too high a percentage of spam reports and unsubscribes, the Campaign Monitor support team was very helpful in working with me to address the issues. There’s a little bit of a learning curve for the templates. You can create a great-looking simple email right away – in fact, it would be pretty hard to create a bad one – but it takes practice to get fancier. Honestly can’t think of any at the moment. I’ve been using Campaign Monitor for several years to send email campaigns for my clients, mostly small to medium-sized nonprofits and civic organizations. I love that it’s designer-oriented – you can create your own custom templates or use theirs. They’ve introduced (and then significantly improved) flexible templates that perform very well responsively. They also take their sender reputation very seriously; when one of my clients inadvertently sent an email to an old list and ended up with too high a percentage of spam reports and unsubscribes, the Campaign Monitor support team was very helpful in working with me to address the issues. There’s a little bit of a learning curve for the templates. You can create a great-looking simple email right away – in fact, it would be pretty hard to create a bad one – but it takes practice to get fancier. Campaign Monitor offers simplicity, powerful email marketing, automation, and online surveys that help growing businesses. They deliver technology that solves complex problems in a beautifully uncomplicated way. Campaign Monitor has a team of 250 people in twenty different cities. Their US base is in San Francisco, but their heart is in Sydney, and their newest office is in London. Small and medium-sized businesses; however, they offer price plans for companies looking to send more than 50,000 emails at a time. More specifically, Campaign Monitor mentions retail, nonprofits, travel and hospitality, and entertainment businesses on their website. It’s free to set up an account and create a campaign. But to send to more than five subscribers, you’ll need to choose a plan. No, but it’s free to set up an account and create a campaign. 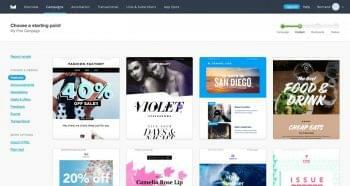 Email Marketing: Use the drag-and-drop email builder and pick from hundreds of professionally-designed templates. Make them your own for a completely branded email campaign that looks great on all kinds of mobile devices. 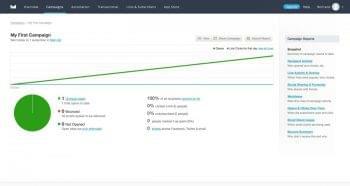 Marketing Automation: Use their new and unique visual journey designer to create more timely emails that keep your audience engaged, and automatically drive revenue. Contacts and Segmentation: Campaign Monitor allows your business to send personal, hyper-targeted messages delivering the right information to the right audience on schedule. Rich Behavioral Data: Coming soon: Capture behavioral data to build better customer segments. It’s the easiest, most effective way to create one-to-one relationships with your customer so you can exceed your business goals and drive more revenue. 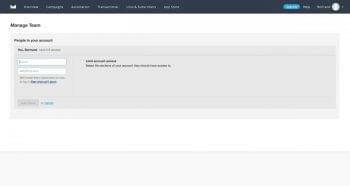 Signup Forms: Use signup forms to build your audience and introduce yourself to new customers. From your website to your store, Campaign Monitor’s tools allow you to do it all from wherever you are. 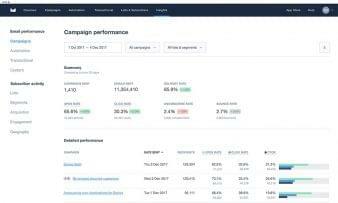 Analytics: Campaign Monitor offers a full analytics suite that gives your business an aggregate view into the performance of your overall email marketing program — including geography, acquisition and engagement per campaign. You’ll get actionable insights on how to improve your strategy. 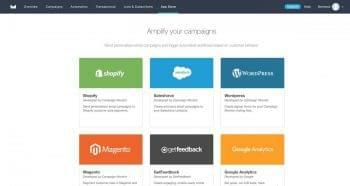 Apps and Integrations: Campaign Monitor has 250-plus, pre-built integrations you can use to connect to your business’ 3rd party apps like Salesforce, Magento and WordPress. Transactional Email: With Campaign Monitor, you can ensure that even your transactional emails are on brand and just as highly optimized as your regular marketing emails. NOTE: Campaign Monitor offers different pricing and plans based on the size of your business. All that changes is the number of seats, and pricing respectively, so we focused on a 500 seat SMB. You can see further pricing here. Contact their award-winning support team any time, day or night, and one of their email marketing and automation experts will get back to you with all the answers you need. Best Workplaces in Australia by BRW. Campaign Monitor is an email marketing provider for businesses who are primarily looking for versatility and easy-to-use customization tools. Integration also plays a significant role in Campaign Monitor’s recent success. They’ve won awards and have been recognized by Companies such as Forbes, Fortune, and Bay Area News Group, solidifying their presence around the world as a great option. With that being said, their features are mostly standard, with some providers offering the same things: click-and-drag design tools, custom templates, marketing automation, and CRM integrations. What stands out is the number of pricing options to choose from, their interactive website, and ability to cover such a wide range of businesses. 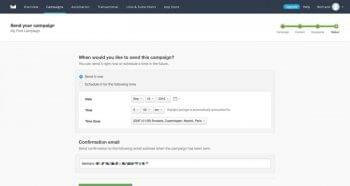 Campaign Monitor’s features are integration-based and allow businesses to customize and operate their own professional email marketing campaign with ease. They offer tons of templates for businesses to choose from, which will provide them with their own unique look. Personal and professional looking emails designed as if they are precisely targeting each customer will give business owners a good chance to establish new connections, maintain strong relationships with their existing customers, and coordinate the timing of significant announcements. Some of these integrations include Shopify, SalesForce, WordPress, Google Analytics, and Facebook. Business owners of all types will be able to afford Campaign Monitor’s services. You choose your plan based on how many people you imagine your business emailing. The choices are 500, 2,500, 5,000, 10,000, 15,000, 25,000, and 50,000+. The higher the number, the more emails you can send, with their most basic plan costing a mere $9 a month. These prices seem to benefit small and medium sized businesses because even their premier plans cost significantly less than other places. Campaign Monitor states on their website that they specialize in retail, nonprofits, travel and hospitality, as well as the entertainment businesses, while most providers do not make a point of mentioning what kind of business is best suited for their services. The fact that they do should show business owners how confident Campaign Monitor is in their product offering. The number of recent awards they’ve won, particularly for customer service and being a top company to work for, proves this point further. Their website is also very easy to navigate. Business owners can find a list all their features, tables breaking down the pricing plans, an extensive FAQ and support page, and demos showing how to use key features, solve certain problems, and highlighting the click-and-drag tool. Overall, Campaign Monitor is a good email marketing option for small and medium sized businesses. Their features don’t seem to stray to far from the norm, but their recognized customer service, their international accessibility, and low prices make them a tough option to pass up. If customization is a top priority for your business, this is a great service to choose from. The number of email templates they provide will keep your business looking up-to-date. If integration is important for your business, Campaign Monitor is compatible with over 250 third-party apps, websites, and CRM software. The significant range of pricing options make this a choice for businesses beyond the ones mentioned on their website. Campaign Monitor is an option that needs to be considered. What Do You Think of Campaign Monitor?